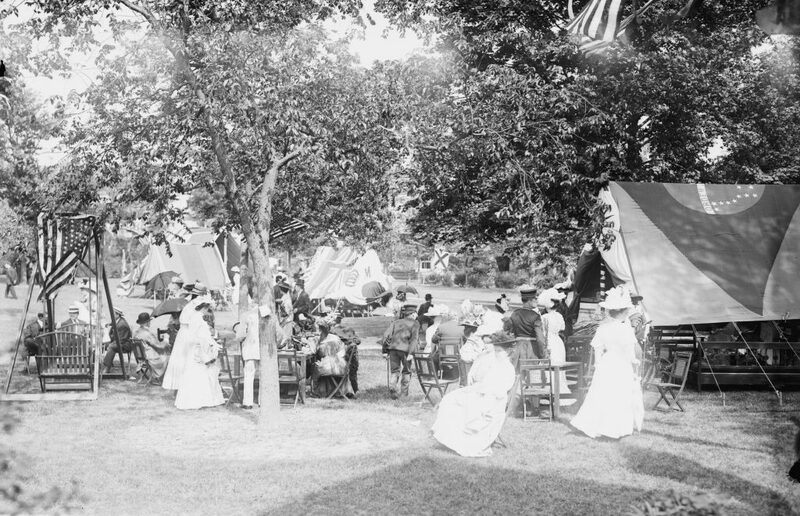 The 1908 party is held on The Green, at what is today called Nolan Park. The Jazz Age Lawn Party created by Michael Arenella carries on a long tradition on Governors Island going back more than 150 years to social events hosted by the U.S. Army. Just as Michael and his Dreamland Orchestra draw big crowds to the Island, so did the soldiers in a similar fashion beginning after the Civil War. While the music and fashions may have changed—seersucker has replaced Army blue—the experience is nearly the same. The party returns June 10 and 11, August 26 and 27. Tickets are $55 to $5,000. Twelve years ago Michael launched the Jazz Age Lawn party not far from where the Army used to have its big summer social events. The location of the Jazz Age Lawn Party is today called Colonels Row Green; before 1910 this spot wasn’t in existence. Engineers added 100 acres of landfill on the south end of the Island; the seawall was roughly along the road that runs next to the party. The brick officer homes had water views. The Army had their lawn parties on The Green (today called Nolan Park), the Parade Ground, the new landfill, and the officers club. 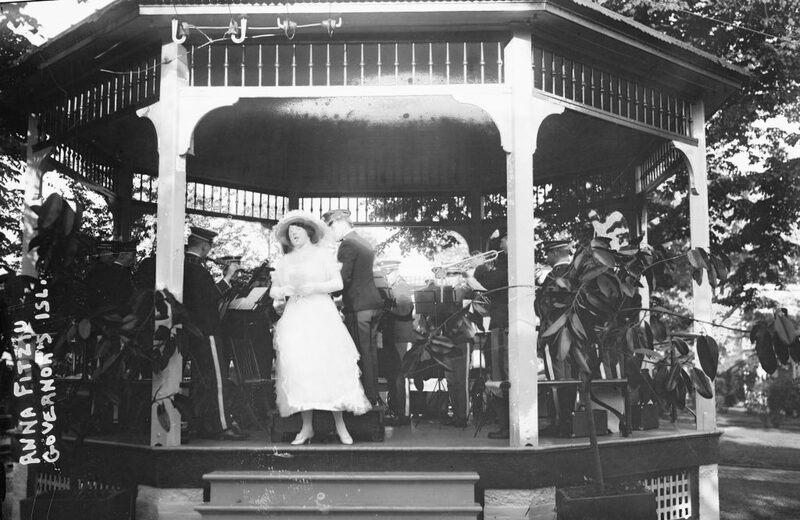 At the May 1916 party on The Green, soprano Anna Fitziu performs The Star Spangled Banner with the Army band. 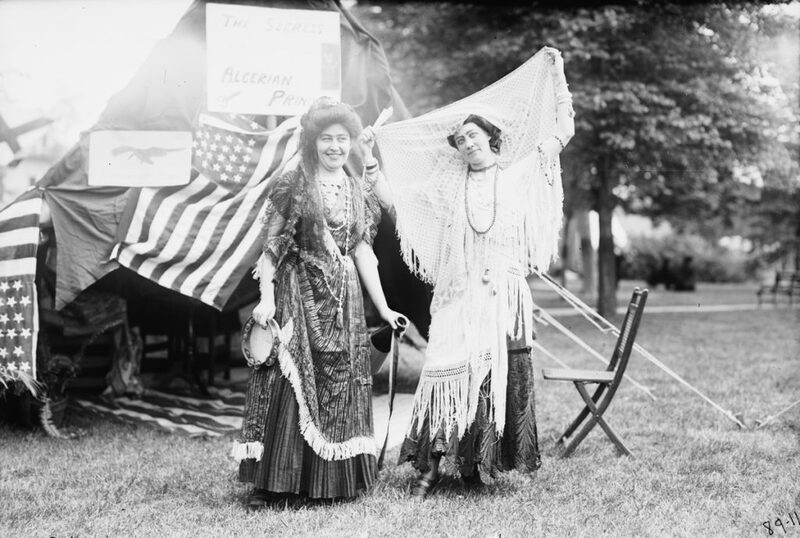 The events were a benefit for the Army Relief Society, which aided the widows and children of soldiers. One bonus of having the Army run the parties, there was never a shortage of prisoners from Castle Williams to put up the tents. At a May 1915 party, the day began with a parade, followed by music from the 12th Army Band from Fort Totten in Queens. A highlight was the polo match between the officers and the Squadron A Polo Club. The Army walked away with a close victory. The tents were located about where Liggett Terrace is today. Soft drinks and cake were served for the all-day lawn party. The special guest was Elizabeth Custer, widow of Gen. George Armstrong Custer, killed at Little Bighorn. Soldiers marched and drilled for the crowd until the 5:30 p.m. Retreat Parade. The party moved to the officers club for supper and dancing. As the Twenties dawned and the Jazz Age was ushered in, the garden parties on Governors Island got bigger. At the same moment F. Scott Fitzgerald was publishing Flappers and Philosophers, the Algonquin Round Table was rolling, and Cole Porter was launching his career. The May 1921 party added fireworks, airplanes zoomed over the crowd, and boxing (if one wanted to skip the fights, organ recitals were in St. Cornelius Chapel). A dress parade led to supper and dancing. In other years organizers held pigeon races and Broadway stars performed. Actress Gilda Gray—credited with popularizing the “shimmy”—put on a demonstration of the Charleston in 1926 in the brand-new (now abandoned) Army YMCA building. Party attendees in 1908 on The Green, Miss Spillar and Miss Kindfred. The June 1929 party dwarfed all other lawn parties on the Island. The 16th Infantry Regiment, veterans of World War I, erected a replica of a French village, complete with a mock château, ruined cathedral, and a townhouse. Soldiers re-enacted the bloody 1918 Battle of Cantigny for the party guests for a two-day mock war. The Army brought out rolling kitchens to serve the guests, who walked down a replica of a battle-scarred street that was two blocks long. Of course none of these parties were “wet” since Prohibition was in place from 1920-1933. Lemonade was served. The lawn parties were an annual social affair that was covered by all the major newspapers. The garden party was a major event on the society calendar, and the names of the debutantes and their parents were dutifully listed each year. Eligible bachelors from West Point were always in attendance. While the lawn party did display the latest Army airplanes and vehicles, it also attracted business leaders such as John D. Rockefeller, Jr., as well as mayors, governors, and members of Congress. It seems like the high point for the parties was World War II. The Army left the Island in 1966, and the Coast Guard took up residence for the next thirty years. It too held events on the Parade Ground, but these were geared to families and the children of the Island, such as the annual August picnic celebrating its anniversary. When Michael Arenella launched the Jazz Age Lawn Party on Governors Island in 2005 he revived a city tradition that had been lost for many years. Wildly successful, the party just gets bigger every year. Will he bring back biplanes and pigeon derbies? Kevin Fitzpatrick is the author of The Governors Island Explorer’s Guide, World War I New York: A Guide to the City’s Enduring Ties to the Great War, and many others. His books are available in Castle Williams bookshop on the island, and online.